The next time you’re driving along the south coast and admiring the waves, don’t feel bad about not packing a surfboard. The WaveWrecker wetsuit can be kept tucked away in a corner of your bot at all times, and when the waves are ideal, it turns your body into its own surfboard. 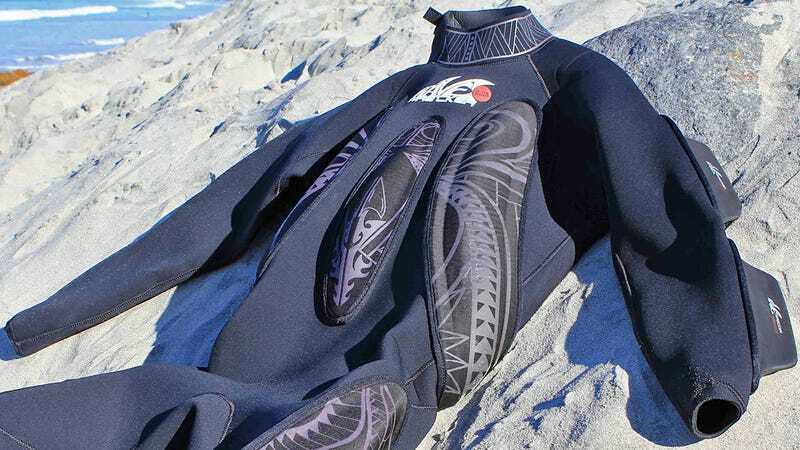 The WaveWrecker’s creator, Nick Gadler, hopes his uniquely modified wetsuit will help boost the popularity of bodysurfing by making it easier for everyone to learn, without needing to use a boogie board for added buoyancy. Over the course of about six years, Gadler created 27 different prototypes before settling on the final design that takes a standard wetsuit and upgrades it with 11 flexible foam fins, which not only increase the wearer’s buoyancy, but also gives them improved directional control as they skim across the water while riding a wave. Gadler has launched a Kickstarter campaign, in hopes of raising a modest $10,000 to help fund production of the WaveWrecker . The adult version of the suit can be pre-ordered with a donation of $350, while the kids version is a little cheaper at $250. Both are expected to ship sometime in April of this year, and both provide a cheaper alternative to hauling a surfboard around wherever you go—just in case the waves are good.